LG 47LM670T review | What Hi-Fi? 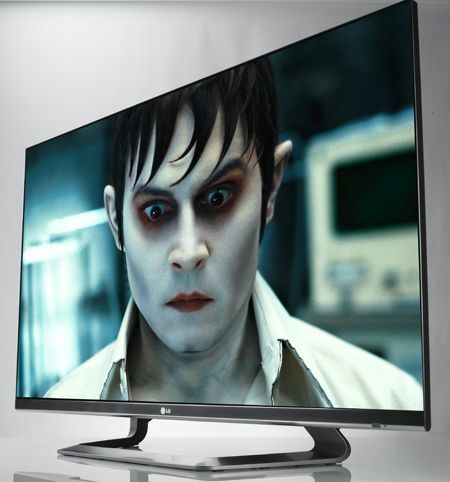 Striking though it may be, this LG 47LM670T isn’t the pinnacle of its manufacturer’s 2012 model range. True, a look at the price tag and the specification confirms it's a very up-market 3D Smart TV – it’s just that LG’s 2012 range is its most expansive so far, as the company aims to reel in its Korean rival, Samsung, in the race for TV sales leadership in the world's leading markets, and to see off its Japanese rivals. It’s a good-looking device, the 47LM670T, and more than capable of holding its end up in the showroom-floor beauty pageant. When the screen’s off, the bezel is pretty much non-existent (or three-quarters of it is, anyway – there’s a relatively broad strip running along the bottom of the screen), and when it’s up and running there’s no more than 1cm of bezel behind that edge-to-edge glass.. The ‘ribbon’ stand is a nice design feature, too (and, let’s face it, it’s difficult enough to differentiate one flatscreen from another, so every little helps). There’s also plenty going on where specification is concerned. As well as the usual extensive selection of socketry (four HDMI and three USB inputs being probably the most relevant), the 47LM670T is a 3D TV. And LG’s belief in the superiority of a passive 3D configuration, using its in-house Film Patterned Retarder technology now being adopted by growing numbers of other manufacturers, means it’s able to provide five pairs of (light and comfortable) 3D glasses in the box. There’s a Freeview HD tuner on board, and a much-improved Smart TV interface – lots of premium services (like iPlayer, YouTube, Netflix and Twitter) are already right there on the homepage, and there are hundreds more services and apps available. There’s a degree of flexibility in the appearance of the dashboard, too, so your Smart TV experience is customisable up to a point. Navigating the legible-but-fairly-dense menus is made a whole lot easier by the Magic Remote, also included in the box alongside an altogether more traditional full-function handset. The Magic Remote features both a scroll-wheel for PC-like up-and-down navigation and a Nintendo Wii-style point-and-click gesture control. Simply point the nicely shaped remote at the screen, move the on-screen cursor around and click to select. After a minute or two it proves an entirely natural (not to mention rapid) way of navigating around the screen’s many menus. There are two additional pairs of glasses included in the price – these are ‘Dual Play’ glasses for use with a games console. Wearing the Dual Play glasses allows players to see two entirely different full-screen images as opposed to the traditional split screen. Games are only in 2D this way, of course, and the resolution remains that of a traditional split-screen image, but it’s a much nicer (not to mention much flasher) way to play two-player games. So the specification and ergonomic niceties are all in place. It doesn’t take long to get the LG set up just as you want it, and in light of the obvious hard work that’s gone into making the 47LM670T an alluring shop-floor proposition it’s a bit of relief to report that its picture-making talent is prodigious. 2D Blu-ray images from Contagion look splendid: blacks are deep and lustrous, with plenty of detail revealed, and they coexist happily with bright, clean white tones. The overall colour palette is on the understated side, though there’s plenty of bite to orange/red tones when necessary, and skin-tones are completely convincing. This is a natural, subtle presentation, and motion-handling (dealt with via a set of protocols LG’s calling a Motion Clarity Index) is confident in even the most trying circumstances. DVD images are upscaled confidently, too. A copy of Crazy Heart offered to the 47LM670T in its native 576 resolution fills the screen with stable, low-noise and decently-detailed pictures – there’s a hint of coarseness to the most complex scenes, but motion is never less than convincing and skin-tones and –textures are impressive as well. And this hint of sharpness and edginess is, we feel, preferable to the soft, short-of-detail images some competing TVs serve up when charged with upscaling duties. LG 47LM670T: look – (almost) no frame! TV pictures are, predictably, a game of two halves. High-definition stuff is gratifyingly detailed – arguably too detailed when it comes to the likes of Masterchef. Colours and contrast are impeccably judged and motion is as smooth as you want. So, as long as you’re tuned to one of the free-to-air high-def channels available, this is a really easy-to-watch TV. Inevitably it’s a different story when you’re slumming it with some standard-definition content. We’ve seen worse, certainly, but the LG doesn’t do low-quality stuff many favours: daytime-TV staples like Homes Under The Hammer are as rough around the edges as the properties they feature, while picture noise settles in early and is nigh-on impossible to shift. There’s nothing wrong with the colours or contrast the LG serves up, but it’s notably intolerant of iffy broadcasts. It's better, then, to indulge in a bit of catch-up TV rather than dwell on the marginal standard-def picture quality. The likes of the BBC’s iPlayer (easily accessed via the exemplary on-screen menus and integrated wi-fi) are, first and foremost, VERY LOUD indeed – adjust the volume appropriately and there’s plenty to enjoy about high-def content. Slightly perversely, there's not quite so much to criticise about lower-quality streamed fare. At its best, online-derived content is detailed, lustrous and stable; at its worst, it’s really no poorer than standard-def off-air broadcasts – if anything, the relative softness of images helps keep picture noise to a minimum. So how's the 47LM670T with 3D? We’ve always enjoyed LG’s 3D ability – the company’s insistence on what it maintains is the superiority of the passive, unpowered system certainly makes for a happily unstressed viewing experience. However, there’s no doubt the relative lack of resolution makes the passive configuration less of a technical tour de force than some competitors’ active-shutter alternatives. In day-to-day use, there’s no denying the 47LM670T is a hugely watchable in 3D. The Adventures of Tintin: The Secret of the Unicorn on 3D Blu-ray is an outstanding bit of software, and the LG delivers it in bright, stable and convincingly three-dimensional style. The 3D depth control is best left unfiddled-with (unless you like feeling a bit queasy, of course): leave well enough alone and the 47LM670T shows far less of the ‘layered 2-D terracing’ effect than we’re used to from less accomplished offerings. For those who react adversely to all this stereoscopic stuff, there’s a menu setting to allow the 3D to be switched from ‘left/right’ to ‘right/left’, which LG reckons will help cut down on fatigue, but in all honesty we didn’t find it an issue. If watching 3D is going to be a big part of your TV viewing, this LG needs to be at the top of your audition list. Even when forcing 3D from 2D content – something of which we've never been huge fans – the 47LM670T does a pretty credible job. Again there’s quite a lot of adjustment available to the perceived depth of the 3D effect, and again we’d advise caution where that’s concerned, but if EastEnders in 3D sounds appealing we don’t think you can currently do any better than this. But only if you must, you hear? Gamers are served well enough – whether in 2D or 3D the LG’s a fast and responsive screen once most of the processing options have been defeated. And 3D games are as easy to watch as any other 3D content, meaning long sessions are on the cards without undue stress or strain. As far as sound goes, the LG offers quite a number of options, but you can skim through them all without ever alighting at a setting that sounds better than average. Of course, ‘average’ is a relative term: flatscreens just don’t sound all that good in our experience, and for all the LG’s lack of body and rather flat, matter-of-fact presentation – function following form, you see? – it fights against sibilance well. LG makes a lot of the 47LM670T's 3D sound zooming, where the soundtrack receives similar emphasis to the images on the screen, but we found it to be something of a distraction and rather a blunt instrument. However, as we seldom tire of saying, if you’ve paid this sort of money for a shiny new telly, relying on its integrated speakers is the falsest of economies. That's a minor caveat agreed, and shouldn't detract from what is a brilliantly enjoyable product that bodes nothing but well for the rest of LG’s 2012 models.